A high quality luggage carrying solution for frames without specific braze ons. These are better than regular P clips, and allow bikes to safely carry luggage, but be careful to not overload the frame. Simply choose the relevant size for your frame. ProsExcellent quality, makes for a solid fixing. I bought two pairs of these to fix racks to a couple of bikes with no built in fixings. Having read earlier reviews I ordered a set a little bit larger than the stay. In my case I used amalgamating tape to avoid a metal on paintwork join. They're well made, strong and the fitting instructions are clear. After using flimsy P clips and seriously scratching the paintwork on my seat stays, I realised that solid clips are vital. Even though the final cost for 4 clips totalled £20.48, they are worth it, especially if you need to carry heavy loads. I recommend buying a set which are a few mm too large, so you can wrap some used inner tube around the stay, as the set up in the picture would scratch your paintwork. Bought these to secure a twin leg rack to my Raleigh Royal which previously had been secure to the brake bridge. These are well made clamps and may not be suitable for people I meet out and about cycling who prefer everything loose and hanging off their bike. Makes for a very stable and secure fitting. Probably only bettered by having 'braze ons' brazed on. Used to secure a rack to an old Claude Butler mtb. Very secure and robust fitting, but the bolts supplied with the 18/19mm set are not long enough to connect the inner part of the clamp, I'd suggest buying a size larger. Otherwise, very easy to attach and use. Rebuilt a old Dawes Horizon for touring. Big surprise when no brave ons on seat stay. These are real quality, superbly strong and spread the load all around the stay as oppose to a braze on. They are a little fiddly but 10 mins and your done. I used these to fit one rack to a frame with no eyelets, and ended up doing more than one bike. These are excellent clamps to fit rack to frame with no eyelets. Very secure. Just take your time making the initial fitting. What rear rack should I buy with these? Is any rear pannier suitable or does it have to be a Tubus? I want to add 2 rear panniers for clothes and camping equipment and place my tent on the top of the rack. These should fit other racks. 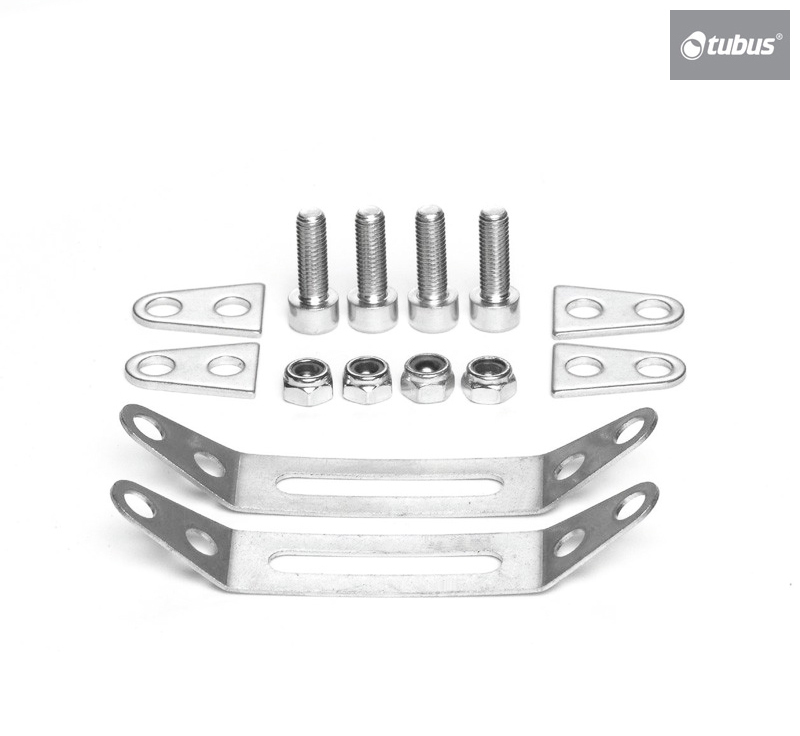 this may be a dumb question but what does the stated size of the tubus seat stay clamps refer to? Is it seat stay diameter?